On May 18-19, Chicago Zine Fest will present its 9th annual celebration of independent publishers in the Chicago area and across the nation. Highlights of the two-day festival include a panel discussion and readings on Friday, May 18 and an exhibition day featuring more than 250 exhibitors and interactive workshops on Saturday, May 19. New for this year, CZF will debut a youth area geared toward the next generation of zinemakers. 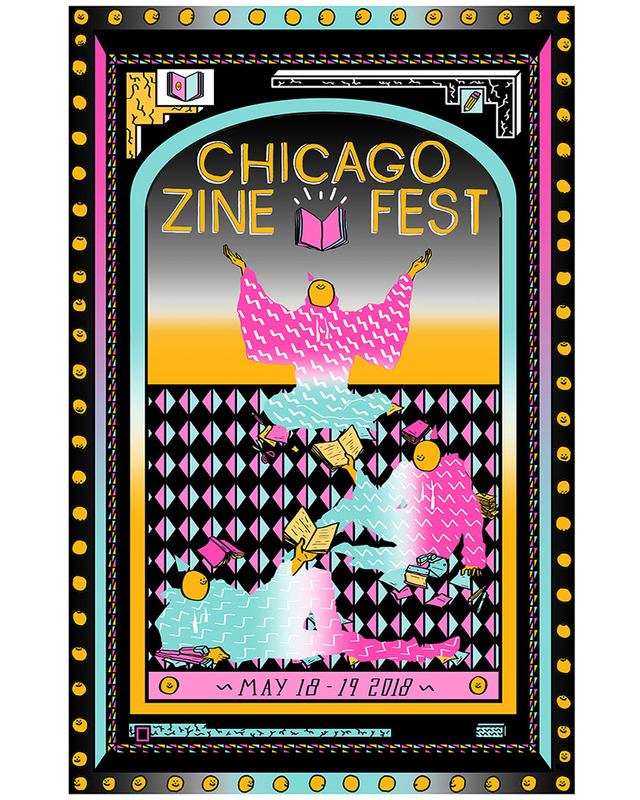 CZF 2018 kicks off at 6:30 p.m. Friday, May 18 with a Panel Discussion, On Speaking Terms: Zines, Librarians and Communities, sponsored by the University of Chicago Library. This panel discussion features local zinester and Chicago Public Library employee Oscar Arriola, Doro of the School of the Art Institute of Chicago's zine collection, and Milo from Queer Zine Archive Project (QZAP), and will be moderated by the University of Chicago's zine archivist, Sarah G. Wenzel. The panelists will discuss how librarians and archivists acquire zines and why, how they shape their collections, the decisions they make every day, and ways that they share zines on ordinary days and through special events. A Q&A will follow. Immediately following the panel discussion, our Friday night event continues at 8pm with our annual Exhibitor Readings. Zine creators exhibiting at this year’s festival will share stories and comics as entertaining as they are moving. Our readers for this year are Zach Auburn, Shira Mario, Megan M. Metzger, Ariel Chan, Marian Runk, Katie Armentrout, and Cathy Hannah.All Friday events will be held at the Institute of Cultural Affairs, 4750 N. Sheridan Rd. in Uptown. Uptown United is sponsoring our Friday events. The festival continues 11 a.m.-6 p.m. Saturday, May 19 with an Exhibition Day featuring more than 250 self-publishers at Plumbers Union Hall, 1340 W. Washington Blvd. in the West Loop. Attendees will have the opportunity to buy and trade zines and comics made by exhibitors from Chicago and around the country. This year, CZF has expanded its offerings for the next generation of zine creators on Exhibition Day. A new youth area will offer a place for young zinemakers from all over the city to meet each other and share their work. Youth organizations represented at the festival include 826CHI, YouMedia, Lane Tech Zine Club, Pathways in Education-Ashburn, Gallery 37, Ag47, and the School of the Art Institute of Chicago. Festivalgoers will hear directly from these young zinemakers at our youth reading, Zines: The Next Generation, which will be emceed by Jane Serenska of 826CHI. CZF offers the community ways to engage and learn through a selection of workshops held during the festival. This year's interactive workshops include framing moments in comics with Chicago Alternative Comics Expo (CAKE), creating fabric banners with the School of the Art Institute of Chicago, and supporting safer spaces in DIY communities with OurMusicMyBody and the F12 Network. There also will be hands-on activities for all ages provided by Busy Beaver Button Company, The Wasteshed. Spudnik Press, and Ag47. There will be a photo booth by Glitter Guts, coffee by Colectivo Coffee, a hair styling station by Haircuts for Change, food trucks, a bake sale, and more! Also onsite will be the Read/Write Library’s BiblioTreka mobile bike library, and Chicago Books to Women in Prison will be accepting book donations. Sponsors of the 2018 festival include Chicago Publishers Resource Center (CHIPRC), InoPrints, Perfectly Acceptable Press, Quimby's Bookstore, Replica Chicago (REP CHI), The University of Chicago Library, and Uptown United. CZF 2018 artwork was created by Chicago artist Yewon Kwon. All CZF 2018 events are free, open to the public, wheelchair accessible, and offer nearby parking options. Visit chicagozinefest.org for more information.